Marlins LHP Prospect Andrew Heaney stays up all day to get lucky. No-hit performances by pitchers are a bit like throwing a bulls-eye in a game of darts. The difference between a skilled dart-thrower and a non-skilled dart-thrower is great; it is unarguably a skill that is improved by the muscle memory gained via practice. Much like anything in life, skill at darts progresses along a curve; making the same effort to improve will provide diminishing returns as you move up in skill. One cannot practice enough to be able to throw a dart into the bulls-eye every time; it is conceivably possible to comprehend, but the amount of practice that would seemingly be required is prohibitive. This same effect can be seen in most any field where skill plays in; an average Joe has a miniscule chance of beating a master dart-thrower in a standard game of darts, but relative to the gap between their skill levels they have a much closer-together chance of throwing three bulls-eyes in a row. There’s an old expression about how you have to be good to get the chance to be lucky, and baseball offers more glimpses at the elite getting lucky than possibly any other modern entertainment. Hitting for the cycle (hitting at all for that matter when you consider BABIP), pitching a perfect game, an immaculate inning or a three pitcher, successful streaks and no-hitters; it’s why all these things are so special. We watch these men, these best of the best of the best in the world, and we watch them learn to gracefully accept failure; so it’s no small wonder that the sight of pitchers embracing catchers is a powerful and visceral recognition of the significance and rarity of the event. As a self-professed ‘Stat-Head’, I must confess that I tend to diminish the significance of these events by reminding myself how much luck was necessary to achieve the results in question, however the cold facts cannot be ignored. 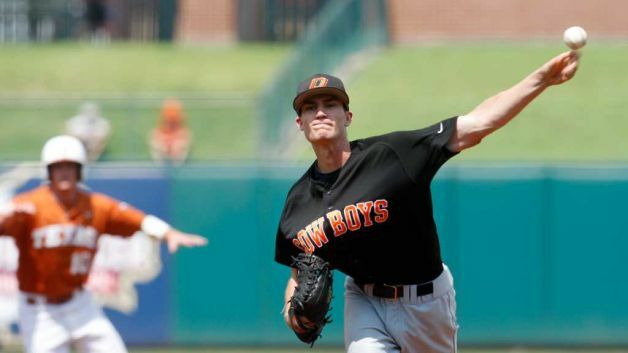 Yesterday, in the hot Arizona sun, Marlins LHP prospect Andrew Heaney came out and shut down the Scottsdale Scorpions for five innings without allowing a hit. This means that over the last three games, three consecutive Glendale Desert Dogs starting pitchers have pitched 5 or more no-hit innings. The Glendale Desert Dogs have essentially walked out there and thrown three bulls-eyes in a row. Granted, they weren’t no-hitters; you’re not going to let a young kid pitch his arm off to throw nine complete innings just for the limited glory of finishing a minor-league achievement that the world will barely see. We don’t get the joyous photos of Glendale pitchers embracing their catchers, recognition of the statistical significance of the feat they’ve just accomplished, as we would if the games were complete ones. The lack of celebrations may make it seem (accurately) like its a quirk, a rarity, but not on the level of a ‘real’ no-hitter or a perfect game. However, with a little napkin math I believe I can illustrate that the Desert Dogs starters have been a part of something that is statistically even more significant. First up, there’s a part I am not mathematically skilled enough to adjust for – League factors. The AFL has traditionally been a “hitters’ league” with many of the top hitting prospects batting around on some of the less polished prospect arms. Going back to 2009, hitters in the AFL have compiled a .790 OPS, not including this year. The year-by-year stats show an overall decline in offense, but even considering the gradual decline, this year’s .714 is still a huge step down in terms of overall offensive production. This year’s crop of pitching prospects is putting on a show for those lucky enough to be watching them from Arizona, and the fact that they’re doing so in a league with the best hitters in the minors, in an environment that is usually more offensively productive than the major leagues, makes it more significant in a way that I am not sure how to account for. Now, the mathy part. By my (admittedly imperfect) use of Baseball Reference’s Play Index, I have attempted to discern the odds of this happening with the obvious caveat that I only had access to Major League game data. Going back to 1969, the year they lowered the pitcher’s mound, I believe there to have been 195,016 pitcher starts where the SP got at least one out. In 169 of those starts, the SP went at least 5 innings without giving up a hit. This means that 5 or more no-hit innings by the starting pitcher has occurred in roughly 0.08665955613% of starts, which can be conversationally simplified to about one in a thousand starts. Using an online probability calculator I only sort of understood, I believe I have come to the conclusion that there is a 0.0000000650803% of this happening thrice consecutively. (If there is an error in my methodology, please point it out in the comments.) If I’m correct, the trio has far outweighed the metaphor of the triple bulls-eye; in fact, according to research done by Wendy Thurm for Baseball Nation, three consecutive 5IP, 0H performances by starters is exponentially rarer than a perfect game. Congratulations are due for Jamie, Alex and Andrew. Additionally, congratulations to Blue Jays top prospect Aaron Sanchez, who also threw 5IP and 0H with 8K on Thursday, adding to the pitching wackiness that has gone on. Does any of this mean anything? Probably not. At the end of the day it is a statistical quirk in a small sample size; the fact that baseball may never see it occur again in no way makes it demonstrative of anything. There are almost certainly less likely things that have still managed to happen, and probably recently at that, but I didn’t happen to look into them. The Glendale trio of Jamie Walczak, Alex Meyer, and now Andrew Heaney have accomplished something incredibly special, and they hopefully will sit back and appreciate that the planets aligned to share in this significant streak together. They had to be good to have the chance to get this lucky, (and make no mistake they are good, at least Meyer and Heaney are among the top prospects in their respective organizations) but they had to be extraordinary lucky to do that good. That doesn’t diminish it, and should do quite the opposite for fans of the Twins and the Reds, and now also the fan of the Marlins. Note to Jamie, Alex and Andrew: If you’re reading this, go buy lottery tickets and enter raffles and radio contests and stuff. I’m not superstitious but I’d say you might as well. Posted on November 10, 2013, in Arizona Fall League, Marlins, Reds, Starting Pitchers, Statistics, Top Prospects, Twins and tagged Aaron Sanchez, Alex Meyer, Andrew Heaney, Jamie Walczak. Bookmark the permalink. Leave a comment.